As you know, I’m a big fan of the Counterpoint series, and I had (somewhat) recently purchased the Four Views on hell. However, recently I saw the updated second edition on Netgalley. This review is for the second edition. After I read the original, I’ll make a few comments on it as well. Level – Medium length, get’s mildly technical, but overall fairly easy. 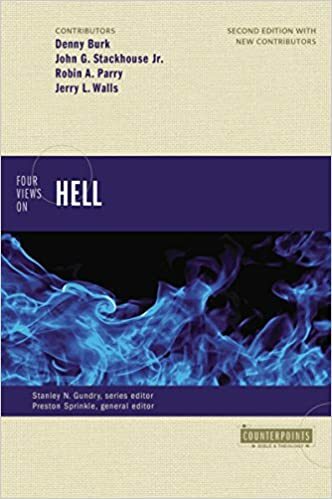 As the title say, the book argues four thoughts on hell. Well, really it is three views of hell, and another who goes on a tangent. All authors believe that hell is real, that it is punishment, and that it is the place that those whom die without the knowledge of Christ are destined to go. Denny Burk argues for the ‘traditional’ view of hell, i.e., that it is a place of eternal punishment. John G. Stackhouse, Jr. argues for ‘annihilationism’ or that those punished in hell will eventually destroyed. They will cease to exist and therefore not receive eternal punishment. Robin A. Perry argues for a Christian Universalism, a term I’m more familiar with is universal reconciliation – that Christ will eventually reconcile all to him, even those in hell. Jerry L. Walls also takes what he calls the ‘traditional’ view, which is purgatory. As far as hell goes, he more or less aligns with Burk, in that it is everlasting conscious torment, but that few people will eventually end up there. Most will end up in purgatory, and then head to heaven. Eternal punishment is probably the most widespread belief among Christians today and throughout history. Burk’s basic argument is that God’s goodness is so infinite compared to us, that our sin (against God) likewise needs to be punished infinitely. Burk makes strong arguments, but where he really shines is in his responses to the other authors. Annihilationism, as Stackhouse points out, dates back as far as the early church fathers, including Origen. He basic premise is that through Christ, we have eternal life, but in sin, we only have death and destruction. Stackhouse probably uses the most Biblical proofs for his argument including the ‘Lake of Fire’ in Revelation. Purgatory is an interesting chapter. Walls believes in eternal torment, but that most will not experience it. Instead, they will go to purgatory and then enter heaven. He argues, somewhat convincingly, that purgatory is the only answer to questions the Bible leaves open about what happens after death and beliefs in heaven and hell. The chapter is a good primer on Purgatory, but as you read it, as well as his response articles, you are left wondering, ‘why are you here?’ He seems to be only tangentially related and possibly should have been in a different book all together. Maybe something about what happens after death, or even one on heaven, or something along those lines. This is really more on the editors, but he does seem out of place. As I said earlier, I hope for universal reconciliation. I just do not think it is the case. I generally land somewhere in between (or rather, go back and forth) eternal punishment and annihilationism, often more to the latter as I see more Biblical support for the idea. I won’t list this as a must read, due to the tangent on purgatory, but for anyone willing to challenge themselves and learn about the different views on Hell, this is a book you should put on your list. Level – Somewhat technical, requires a higher level knowledge of Genesis and some theology, somewhat short, but at times reads longer than it is. This book is exactly what the title says, though there is one different aspect that I haven’t seen in other volumes of the series. Outside of the intro but the series editors and the four chapters on the different views, there is a final chapter called ‘pastoral reflection.’ This is basically a ‘unity & love’ chapter, ostensibly because this is a very touchy subject. In fact, Barrick, who in my opinion makes the weakest argument, implies we should be suspicious of the salvation of those with different views than his own. It is a very disappointing view for an author in this series. His view is essentially Theistic Evolution, but prefers this name on a semantic level. There is no historical Adam, and there doesn’t need to be. God created the natural order and the world proceeded in an evolutionary way. He has interesting arguments on ‘ancient science’, that is, what the writers of the Bible would have understood as fact. Even if you completely disagree with everything he says, his chapter is worth reading solely for this, as it will challenge you to understand the Bible as the original audience may have viewed it. A clearly brilliant man, with two PhDs, has to waste too much of his word limit ‘proving’ his Christianity. Again, we have old-earth creation that views much of the first few chapters of Genesis through a literary lens. However, he is never conclusive as to whether or not there is a historical Adam. He may personally believe there was, but under this view, it can be either way. Basically, ‘Adam’ is an allegorical representation. He is ‘elect’ and chosen, much in the same was as Enoch, Noah, Abraham, and Moses, though some of them clearly existed. That isn’t the point of the story, though. Great info in this chapter pertaining to the writings and beliefs of the Ancient Near East. Collins isn’t too different than Walton. He would agree with most of my summary above, but on Adam and Eve he has a little more nuance. He still does not require historic, first human Adam, but he does view him as historical. He has an interesting view of historical but not ‘literalistic,’ while arguing that we should not get too bogged down on this historical person of Adam. So, it is history, was written to be history, was read as history, it’s just not a type of history (historicity) that we deal with today. This is an important distinction for many evangelicals to consider while researching their view of Genesis 1-11 in general and Adam in particular. This is the view that people think of or the media mean when they use the term creationist. That is, a focus on the world being created exactly as described roughly six thousand years ago. This obviously is in great conflict with science, as well as most Christians and theologians. Science aside, this view also fails in light of literature and history, which is clearly demonstrated by the other views. There is not much evidence proposed in this chapter and is fairly weak in my view. Of course, I think everyone should be reading books in this series. However, I couldn’t quite put this on the must read list. Partly because I like to keep those in that rating small, but also this book does get somewhat academic. That being said, if you are already familiar with the theological issues involved with a historical Adam and have a broad understanding of the relations between Genesis and the age of the universe, then this book would probably be considered a must if this is an issue that you care about. I personally found myself in agreement with multiple points from the first three authors. I thought Walton made an interesting point of Genesis 1 vs. 2, as being two completely different stories. The idea of historical Adam and billions of years old universe are important issues. I still haven’t full development my own theology on the issue. I tend to lean towards an understanding of an historical Adam, but I in no way think the world is not millions and billions of years old. My view is somewhere between Archetypal and Old-Earth, that is an ‘elect’ historical Adam that had some sort of special interaction/relation with God, but isn’t necessarily a special or first creation. I’ve posted many articles about reading recently and wanted to highlight a series here. I first came across these a few years ago and was instantly intrigued. I thought it was a great way to show differing views with the spectrum of Evangelical Christianity. After reading a few, I’ve put them on my list of must haves for anyone interested in gaining a deeper understanding of a topic. The book starts with a topic (Adam, Hell, Women in Ministry, etc. ), and then has three to five people make their case for their particular view. The authors are usually scholars who have written many books or commentaries on the subject. However, the generally do well writing to a broad lay audience. After each makes their proposal, the others make short critical responses. The original author then has a chance to briefly respond to the criticisms. I really can’t imagine a way for Christians to get such an in-depth, but (fairly) short and simply written scholarly discourse. Every Christian who has an interest or struggle in belief in a certain issue should start with the Counterpoint series. If you are interested in buying, you can find them quickly through my amazon store.